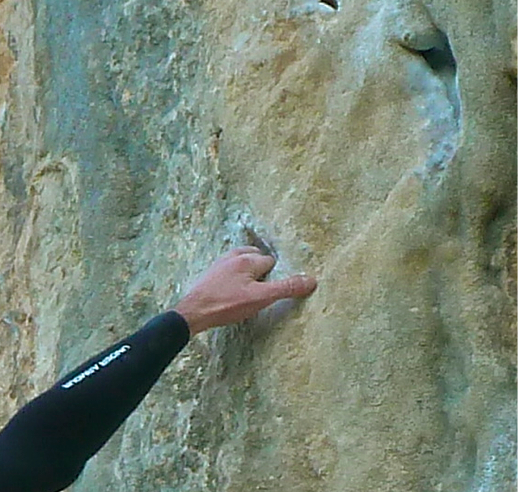 While in El Chorro, I managed to get in and tick another 8a at the end of the trip. I'll be honest, it was a bit of a surprise it came so easily as I thought I hadn't been doing that much climbing the past couple of months with the new job. In the end it took 3 redpoint attempts (so did it on my 4th go after going on it once to try out the moves). Since it's the start of the year, and I can see loads of people getting active with fresh motivation after the Christmas splurge, I thought it was worthwhile to put some thoughts down on screen to give some perspectives/motivation for others aspiring to climb a harder grade (be it at any level). The biggest thing you could do is just get on the harder routes! So many times, it's easy to think they're too hard, you're not good enough, etc and avoid trying the harder routes. All I can say is that you'd be surprised, so long as you go on them with an open mind, a willingness to try, and some keeness to share the information between others who are going to try it also, you will be fine. I'm not trying to say get on something wayyy harder than you've climbed but you could definitely go a grade or two above what you've done before. As part of this, you also have to accept the idea of practicing, or redpointing, a route. While many people in Ireland avoid it while away on a sports trip, usually under the excuse that they don't have much time and want to spend doing new routes, everyone can benefit from trying harder routes because it brings up your onsighting ability which means you'll have even more routes to onsight! While at climbing walls, it's easy to get into the habit of using massive footholds and pulling either monster holds/jugs. On harder routes, you will not get this type of holds unless it's really steep. I'm going to use the above photo as an example. This is the rest point on the 8a at the 4th bolt. You can tell the angle of the rock by the quickdraw above my head (10 degrees or so overhanging). As you can see from the feet, they are much small than resin holds on an indoor wall! That's not to say it's impossible but remember to spend time on vertical to overhanging terrain with small footholds. In time and with practice, you will (not might, will!) learn to recover and rest on holds of these types. It also means you need to spend time getting very accurate with your feet, accurate and specific foot placements are critical. handhold is a medium sized hold, very incut and positive. Right hand is in chalked sidepull in top right of image. 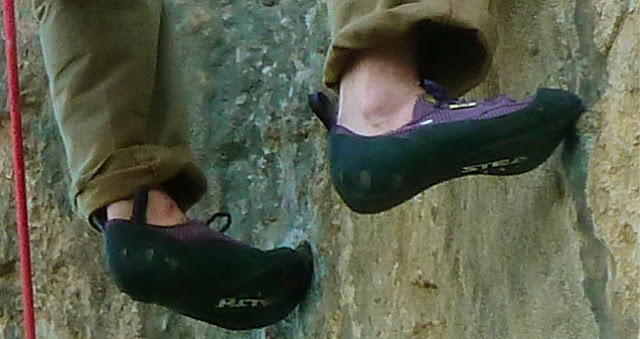 From the image of the handholds, you can see they are good, very good. Having said that, they are not massive juggy holds that you will find on any climbing wall in the world. Again, spend time on medium sized holds if you can to build fitness. At it's most extreme, the best climbers in the world can recover something smaller than a one-joint edge, so for 'normals' like the rest of us, it's possible to build up to the point of recovering on most holds. In short, hopefully this gives some pointers into what is expected of harder routes. If you practice at your local climbing wall on smaller holds, prepare with a bit more intensity, your grade on routes (be it trad or sport) will most likely increase this year. I'm following a new approach to training this year. For the last couple of years I've been setting goals around performance, but this year I'm trying to set some goals around failure. Performance related goals often left me nervous on attempting something at the level I was aiming for. I'm currently trying to break into 6c for sport climbing. Last year I attempted about four routes of this grade indoors, I climbed one route outside of this grade, and failed on one route of this grade outside. Each time I was really nervous, and I spent most of last year climbing 6b/6b+. This year I'm setting myself the goal of failing (need to make all the moves and make it to the top, so that I make gains from the attempt) on at least 10 routes of 6c or harder per month. In January I've already tried 13 routes of 6c or harder, flashing one 6c+ at the gym and repointing two 6c routes at the gym. In one month I've already done more at that grade than I managed in all of 2011. Nice attitude Ian, and seems to be obviously working :) Definitely the trick is to continuously try things that are a challenge. In doing so, physically you'll adapt and in time become 'easy' (or easier at least :). Really looking forward to hearing how this goes for you this year!